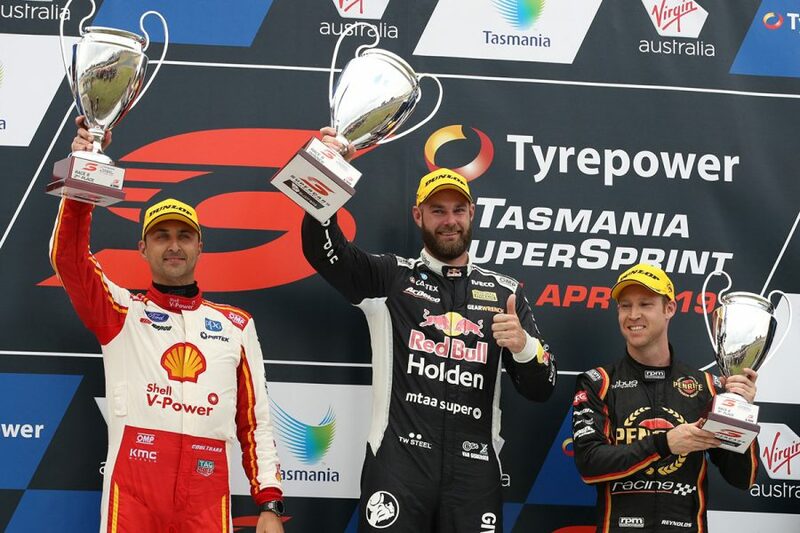 Shane van Gisbergen won the second leg of the Tyrepower Tasmania SuperSprint to halt the Ford Mustang's winning run. Ford's new Supercar took out the first seven races of 2019, before the Red Bull Holden Racing Team driver broke through at Symmons Plains. Van Gisbergen was only headed through the second stint on strategy by Shell V-Power Racing's Fabian Coulthard. He reclaimed the lead early in the second half of the 84-lap race and went on to win by 5.1877 seconds. 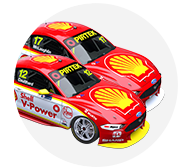 Coulthard kept David Reynolds at bay to finish second, while championship leader Scott McLaughlin was a quiet fourth. Light rain that fell pre-race was largely inconsequential, even when it returned briefly late. 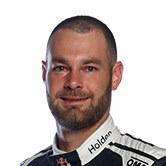 Polesitter van Gisbergen kept the lead off the line from Coulthard, then gradually pulled away through his first stint. He ultimately led by 2.8s by the time Coulthard pitted on lap 24. Coulthard emerged behind team-mate McLaughlin, who started the pitstop sequence 10 laps earlier from fourth place, behind Mark Winterbottom. Having found a smooth passage by McLaughlin, Coulthard then utilised an undercut of his own against van Gisbergen. The Red Bull Holden pitted five laps later and emerged in second, and had to fend off a challenge from McLaughlin on cold tyres. 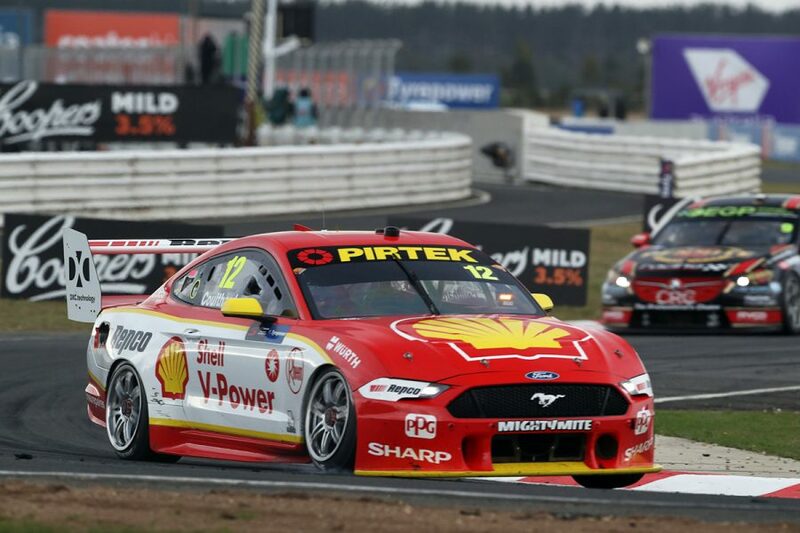 From two seconds behind, van Gisbergen ranged up to the back of Coulthard's Ford approaching the halfway mark, then reclaimed the lead on lap 43, before the second stops started. He led by 2.6s when Coulthard pitted again on lap 55, then followed suit the next time around to negate another undercut. Van Gisbergen emerged with a similar advantage, and cruised away at the front to more than double that. 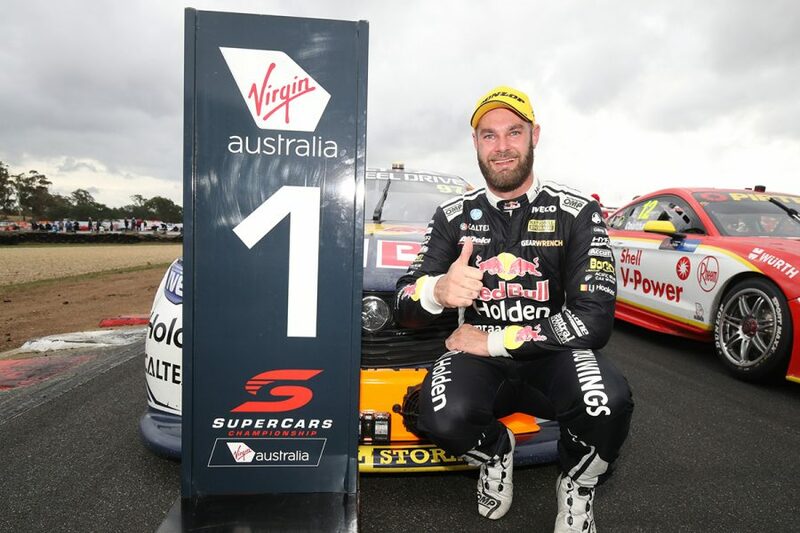 With his first win of 2019 and 32nd of the New Zealander's career, van Gisbergen moves back up to fourth in the championship after a torrid Albert Park weekend. "It’s good to get one back," he said. "What an awesome race, Fabian kept getting me out of the pits, and I had a great battle with him and Scotty. "Once our tyre life was good I knew I’d be ok and the team did a fantastic job in the pits. "We’ve made a huge step forward with our car. "Thanks to Red Bull Holden Racing Team, it’s been a mega weekend to bounce back from our shocker last time." Coulthard's focus in the final stint shifted to Reynolds behind. The pair engaged in a lively exchange entering the final 20 laps as rain built up, Reynolds getting ahead briefly. 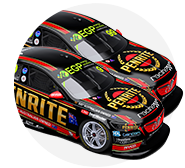 But the Penrite Racing driver could not make it stick, Coulthard crossing the line as van Gisbergen's closest challenger. 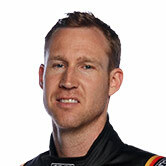 "[Van Gisbergen] was definitely the quickest car today. We gave it our best shot," Coulthard said. "We’ve had a lot going on in the week and to come back the way we did was pretty awesome." The result was Reynolds' first podium of the 2019 season. After pitting early, McLaughlin had to nurse flatspotted tyres during the second stint, relinquishing third place to Reynolds. His final stop was also before those around him, and McLaughlin managed to stay ahead of Winterbottom as the strategies played out. McLaughlin drove a relatively lonely final stint to bank valuable points and leave Tasmania with a 124-point championship lead over Coulthard. 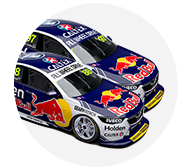 Jamie Whincup and van Gisbergen are third and fourth, 160 and 166 points adrift. Whincup made steady inroads from 13th on the grid, and picked up fifth place with 25 laps remaining from a just-pitted Winterbottom. He did enough to withstand a challenge from Winterbottom, who had to settle for sixth. Nick Percat started 16th but was the race's big mover, the Brad Jones Racing driver finishing seventh. 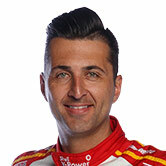 Anton De Pasquale was seventh in the final stint when the gearstick broke in his Commodore. Stuck in gear, he pitted briefly but was sent back out and eventually classified 23rd. Eighth went to Scott Pye, ahead of the Tickford Mustangs of Lee Holdsworth, Chaz Mostert and Waters. 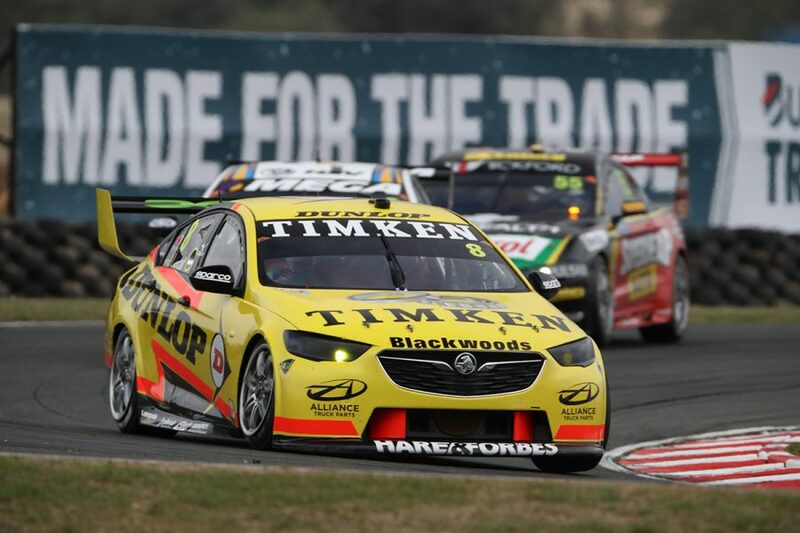 Holdsworth and Mostert both lost ground on the opening lap, falling to 23rd with a Turn 1 off and 15th respectively. Richie Stanaway ran in the top 10 through through the first stint, but finished 19th after a cross-threaded wheelnut at his second stop. Drivers and teams will be back in action next weekend for the WD-40 Phillip Island SuperSprint.